Leon Turnwald bought the 10-20 4WD at his Uncle Johns estate auction in 1992. It was in pieces, the chassis and tires covered in dust with the motor in the loft above. The sheet metal was piled nearby, clearly John had plans for the tractor before his passing. Just what those plans were, no one is quite sure. Leon remembers his uncles, both bachelor’s, John and Frank as a slightly eccentric pair, always tinkering with equipment to better suit their farming methods. The restoration of the tractor brought insight to how the brothers John and Frank built the 4WD tractor in the 1940s. 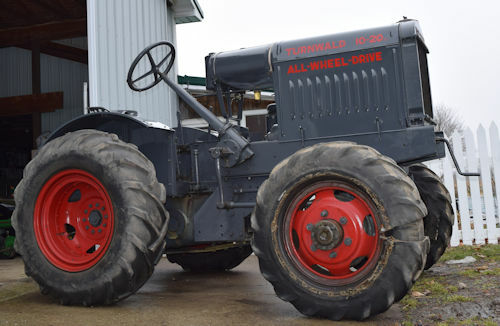 Tailored to meet the need for a larger tractor during the War shortage, this tractor was built from a 1929 10-20 McCormick Deering tractor with a custom built gear on gear transfer box, and a 1940 army truck donated the mechanical front end. 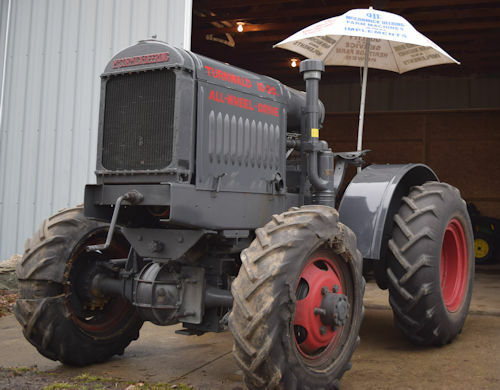 The tractor at one time had four wheel hydraulic brakes, although how they worked and operated has eluded Leon in his restoration of this tractor – he hasn’t given up though, and hopes to make that work in the future as well. The cast tub for the tractor was hand cut-off to install the scratch-built transfer case, for the ability of the tractor to become operational all-wheel drive. The stub shafts for the 12 forward/4 reverse speeds were originally shimmed with shingles, pieces of wood, old leather and cork gaskets, basically anything that was available on the rural farm in the 1940s. The drawbar was anchored in the center of the tractor for better draft control and is evident in one of the photos pictured. Lever to operate the gearing was an old implement handle, custom-fit for the machine. Originally the 10-20 came on steel wheels, the rear spacers are from the steel wheel rims. Steel wheels were original to the 4WD tractor, when later converted to rubber after the war, it required a bar tire to be cut and bolted over a truck tire, custom fit to obtain the correct gearing. Other, more common, traditional experimental methods in that era, were to use the same size tires both front and rear with a direct drive – simple and effective. The brothers chose to use the smaller sized front wheels to maintain the tighter turning radius, allowing for better control under working conditions. They were particular about the farm equipment they built and although the brothers were well known for their abilities, they were a fairly reclusive pair. With nothing more than an eighth grade education, they were capable of many inventions, problem solving many other farmers issues as well. The tractor wasn’t used in the front field much, mainly in the back, away from the neighbors. When it was plowing with a modified P & O Little Genius 3x14” plow, regardless of location, the neighbors would come to the fence row and watch it work. Leon has been able to locate, restore and reunite the original plow with the tractor, and causes a commotion still when he demonstrates to the public the 3 bottom, 17” wide plow and 10-20 tractor. 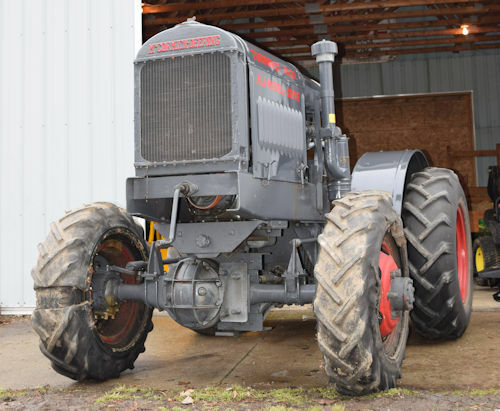 The sale of the original 10-20 tractor may have been bought at New Lothrop Hardware. Sadly the former IHC dealership is no longer in business. New Lothrop Hardware, as well as many other towns, was the place to gain knowledge about what the farmers in the area were doing. Contact was made with the head of IH by the local Blockman at the time that had heard about this tractor and the talk it generated in the farm community. The brothers agreed for IH testers to come and take the tractor away for testing at an unknown IH location. When the Journeymen brought the tractor back after testing in the mid-1940s, the dealer called up the brothers to let them know it had been returned. The brothers drove into town in their 1928 Chevy truck, one of them got out and started up the tractor and off they drove back their farm a few miles away without saying a word to anyone. The IH men looked at each other and wondered out loud, just who really built the tractor as the brothers drove away. The IH department dismissed the idea of building the tractor as they did not think there would ever be a need for a 4WD tractor on the farm. The idea of such a luxury tractor would also be too expensive to buy or even build. Mid Michigan Old Gas Tractor Association (MMOGTA). The contents of all materials available on this Internet site are copyrighted by Mid Michigan Old Gas Tractor Association (MMOGTA) unless otherwise indicated. All rights are reserved by Mid Michigan Old Gas Tractor Association (MMOGTA), and content may not be reproduced, downloaded, disseminated, published, or transferred in any form or by any means, except with the prior written permission of Mid Michigan Old Gas Tractor Association (MMOGTA). Any unauthorized usage on newsgroups, or other internet sites, or unauthorized reproduction, printing or sales of these images is prohibited under existing Federal Copyright laws of the United States. We will actively prosecute those that duplicate, distribute or otherwise use our images without express written authorization or release. Mid Michigan Old Gas Tractor Association (MMOGTA) maintains this website to enhance public access to information about its functions and policies in general. Our goal is to keep this information timely and accurate. If errors are brought to our attention, we will try to correct them as soon as possible. Mid Michigan Old Gas Tractor Association (MMOGTA), however, accepts no responsibility or liability whatsoever with regard to the material on this site.